If NBC's Flip Wilson and ABC's The Mod Squad, once big guns in their time periods, have found their firepower diminished this season, it is only partly because they are on opposite each other. 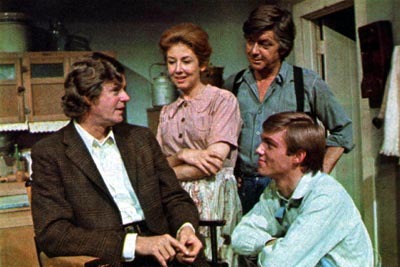 There is a strictly small-arms entry in the CBS Thursday night line-up called The Waltons that has been sharpshooting holes in their self-esteem, not to mention their Nielsen ratings. At first glance The Waltons would seem to be a threat to nobody. This gentle story of rural family life in the back country of Virginia has no overpowering names or "star" personalities. It is what the trade calls a "soft show": no loud-hailer jokes, no titillating rattle of gunfire, no high-decibel calls for Dr. Kildare, no heavy confrontations of any kind. What's worse, it is about poor people trying to last out the Depression in 1933, one of the bleakest periods in our history. Without apology it extols the simple virtues of chastity, honesty, industry, thrift, family unity and love. Its stories frequently deal with life's rejects-the faded actress, the failed writer, the lovelorn blacksmith, the unforgiving preacher, etc., who learn and gather strength from their brush with The Waltons ' If it has any "relevance." it is that the Waltons are primarily concerned, in the modern term, with the individual soul. "We touch a common chord," thinks Earl Hamner Jr., the novelist-screenwriter on whose boyhood memories The Waltons is based. "Also the heart, of which I am not ashamed. There is something people can relate to their own lives-a father's concern for his daughter, a mother's concern with her child's destiny. They are more relevant than Mannix being chased up a dark alley. Our stories would make sense to Hottentots or Eskimos." To Hottentots and Eskimos maybe, but to nervous network programming chiefs, accustomed to playing the game by the numbers, not likely. It took almost 12 years for The Waltons to bring its light out from under a bushel, and it happened then only by a series of unlikely accidents. In 1960 Hamner wrote a novel called "Spencer's Mountain," about his growing up in the Blue Ridge country. "Really the story of how I got into college," he explains. "It started out to be quite successful, briefly made the best-seller lists, and attracted enough attention for Warner Bros.' to buy it. They switched the locale from Virginia to the Grand Tetons-it was that kind of a movie. Henry Fonda played the father who sacrificed his 'land' to get his son into school, thus giving the impression that he owned the Grand Tetons. My father never 'owned' anything. Whatever it was the story had, they ruined." Ten years later he was to try the family again in a novella called "The Homecoming." "it had no real plot," says Hamner. "The father disappears on Christmas Eve. John-Boy -me- goes out looking for him and gets mixed up with two old-lady bootleggers, a Robin Hood bandit and the minister of a black church. He never does find his father, but the father does come home bearing gifts." Through an agent, this slight book reached the hands of Lee Rich, a producer (The Rat Patrol) with a sharp eye for the unusual. On impulse he sent it to Phil Capice, CBS director of special programs. Capice liked it. His wife, he later told Hamner, cried -when she read it. Early in 1971 Hamner was assigned to do a two-hour script. As networks will, CBS began to develop nagging doubts. Interminable meetings were held. Hamner was directed to prepare a shorter version. A script was sent to Patricia Neal, who had recently made a dramatic recovery from the stroke that nearly killed her. Perfect for the mother, Rich thought. Nothing happened. Then one day in September Rich received a call from CBS. "It was insane," he recalls. "They wanted the two-hour version and could we have it by Christmas? We weren't even cast. The Jackson Hole, Wyoming, location was a backbreaker. Luckily it didn't scare Pat Neal. I caught Richard Thomas in 'Red Sky at Morning' and knew he was the kid. I got Andy Duggan to play the father and Fielder Cook to direct. It was magic. Suddenly we had a show. Even then we just did make the air date." It never occurred to Hamner, Rich or Capice to propose their sentimental Christmas card as a series. They were even doubtful that they could make a showing against the 7:30 competition, a flashy Disney special called "Disney on Parade." When, with virtually no promotion, "The Homecoming" ticked off a surprising 39 share-of-audience and the critics described it as a "Christmas classic," CBS programming chief Fred Silverman blinked and suggested a series. "I thought he was crazy," says Rich. "Particularly without Pat, who was physically unable to do a series. All you had to do was look at the kind of programming on the air already. With Cary Grant, maybe. I've been around; I was being	realistic." But Rich, insofar as he could, put a hold on his actors. Hamner wrote three scripts and an additional 10 storylines. CBS "liked" seven of them. Otherwise there was an ominous silence. Then one day Silverman called with the bad news. "No chance without a star," he said. Rich cursed the day he ever allowed himself to be bamboozled into such an "unrealistic" project. "I got down on my knees to every mature leading man in town," he says. "Then out of the blue Henry Fonda's agents called to say he loved it. But even that was a dry hole. It seems the agents failed to check with Hank." Fonda-when he finally got around to reading it-"loved it" all right. But there was a catch. "It's the mother's and the boy's show," he told Rich. In the end, after two rewrites were done to demonstrate that Fonda would indeed be the star of the series, he rejected it. Rich breathed a sigh of relief; at least he was off the merry-go-round. But he had not figured on William Paley. The chairman of the board of CBS had seen "The Homecoming" and -thought it "brilliant." "Fonda?" he said. "Who needs Fonda? The star is that boy and the family. We've been taking from the well long enough; it's time we put something back." Lest anyone suspect Mr. Paley of polishing up his halo at his programming department's expense, it should be noted that the networks were under renewed attack, at the time, for "violence" in their programs. Here was a show that would help reverse that trend. From Hamner's point of view it was an unexpected windfall. 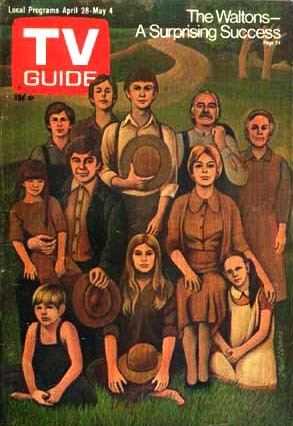 The Waltons could now do a variety of stories, without being locked into shining up a star's image every week. It allowed, he says, "for the excitement of character relationships." If, to paraphrase George S. Kaufman, TV series based on character relationships are something that closes on Saturday night (and it is surprising how widespread that philosophy still is). then The Waltons still had a lot of giant killing to do. Encouraged by their seeming ability to weather almost any crisis, Hamner, Rich and the line producer. Darryl Zanuck's ex-son-in-law Robert L. Jacks, set out to find actors who could play "character." Their "new Henry Fonda" turned out to be a little known New York actor named Ralph Waite, best remembered for his playing of Jack Nicholson's impotent brother in "Five Easy Pieces." Waite, an introspective man who started out life as a country preacher, lends John Walton the kind of authenticity a more familiar face could never give it. "JohnBoy may be the energy, the motivating force," thinks young Richard Thomas, "but it is Ralph who brings the richness, the fullness of tone." Likewise, Michael Learned, she of the richly textured name, has seldom if ever been seen outside of San Francisco's high-minded American Conservatory Theatre (ACT). She was doing Noel Coward's "Private Lives" when Rich caught up with her. Now she had to follow Pat Neal, a task she approached with uncommon zeal. Will Geer (who replaced Edgar Bergen as Grandpa) and Ellen Corby brought their great gifts as character people but didn't guarantee many viewers either, Thomas, their "star," had finally, after years as a child actor (John Roosevelt in "Sunrise at Campobello"), made a small splash in "Red Sky at Morning," but at the box office he was not yet Ryan O'Neal. What he was was bright, concerned and undistracted by the blandishments of fame. Fame seems less attractive to him than, say, the poet Ezra Pound, or his Chinese studies at New York's Columbia University to play John-Boy. Best of all he has that open quality that characterizes Hamner himself. As Earl says, "He plays me as a kid better than I did." With all that going for him, it is no wonder that Hamner is a happy man. "Maybe I'm naive," he says. "This morning heaven was getting to the office." Why not? As the show's story consultant, it is he who sets the tone of The Waltons, supervises the writing and reworks the dialogue to give it "the right feel." It bothers him not at all that none of his four novels has, ever made the big breakthrough, and that he was obliged to make a living for 20 years doing more routine tasks for movies and TV. He put in 10 years as an NBC staff writer in New York, eventually breaking through into script writing. His present eminence - and the worry-free way of life it makes possible for his wife and two teen-age children - seems to him a vindication of sorts. "Coming from the backwoods, (Schuyler, Va., some 90 miles from Richmond) you have not been exposed to ideas," he says. "You feel stupid. Intellectual thoughts scare you. Our concerns with staying alive. But it had an advantage. It gets you closer to the rhythm of life." Nor does he fret about the compromises he is obliged to make, which might have other "serious novelists climbing the walls. "Take my father, my real father," he says. "He cursed with every line. It was part of the richness of his personality. It was the Depression and he had something to curse about. I'd rather tone that part of him down, and keep millions of people who might be offended looking. "I don't have any huge message for them. Other writers have more stunning things to say than I do. If The Waltons is saying anything important, maybe it is just that ordinary people are capable of more nobility than they know."